Many words commonly used in America today have their origins in Celtic roots. While the following three terms are associated today with the American South and southern culture, their origins are distinctly Scottish and Ulster-Scottish (Scots-Irish), and date to the mass immigration of Scottish Lowland and Ulster Presbyterians to America during the 1700’s. The origin of this American nickname for mountain folk in the Ozarks and in Appalachia comes from Ulster. Ulster-Scottish (The often incorrectly labeled “Scots-Irish”) settlers in the hill-country of Appalachia brought their traditional music with them to the new world, and many of their songs and ballads dealt with William, Prince of Orange, who defeated the Catholic King James II of the Stuart family at the Battle of the Boyne, Ireland in 1690. Supporters of King William were known as “Orangemen” and "Billy Boys" and their North American counterparts were soon referred to as "hill-billies". It is interesting to note that a traditional song of the Glasgow Rangers football club today begins with the line, "Hurrah! Hurrah! We are the Billy Boys!" 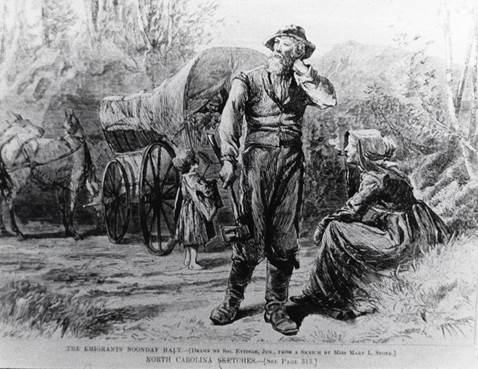 and shares its tune with the famous American Civil War song, "Marching Through Georgia". There are many reports of Southern National Guard units being serenaded with this tune, much to their chagrin, upon arriving in the British Isles during the First and Second World Wars, as the tune is very popular with British and Commonwealth military bands. The origins of this term are Scottish and refer to supporters of the National Covenant and The Solemn League and Covenant, or "Covenanters", largely Lowland Presbyterians, many of whom would flee Scotland for Ulster (Northern Ireland) during persecutions by the British Crown. The Covenanters of 1638 and 1641 signed the documents that stated that Scotland desired the Presbyterian form of church government and would not accept the Church of England as its official state church. Many Covenanters signed in their own blood and wore red pieces of cloth around their necks as distinctive insignia; hence the term "Red neck", which became slang for a Scottish dissenter. Since many Ulster-Scottish settlers in America (especially the South) were Presbyterian, the term was applied to them, and then, later, their Southern descendants. One of the earliest examples of its use comes from 1830, when an author noted that "red-neck" was a "name bestowed upon the Presbyterians." Another term for Presbyterians in Ireland was a "Blackmouth". Members of the Church of Ireland (Anglicans) used this as a slur, referring to the fact that one could tell a Presbyterian by the black stains around his mouth from eating blackberries while at secret, illegal Presbyterian Church Services in the countryside. Another Ulster-Scot term, a "cracker" was a person who talked and boasted, and "craic" is a term still used in Scotland and Ireland to describe "talking", chat or conversation in a social sense ("Let’s go down to the pub and have a craic"; "what's the craic"). The term, first used to describe a southerner of Ulster-Scottish background, later became a nickname for any white southerner, especially those who were uneducated.